The largest city in the U.S. state of Minnesota and bisected by the Mississippi River, Minneapolis exists as a unique blend of natural beauty and urban development. While there are many parks and lakes throughout the city, Minneapolis is also a hub of cultural landmarks and entertainment. For a little something difference and a taste of the local flavor, try visiting one of Minneapolis’ food and flea markets. You never know what treasures you’ll discover! The Alamo Flea Market has become well known for being a one-of-a-kind neighborhood gathering where you can find just about anything. With an average of 45 vendors, visitors can find a multitude of unique items with different kinds of jewelry, vintage bikes, postcards, antiques, plants, vintage clothes, gemstones, tools and furniture, CD’s, videos, vintage framed art, and pretty much anything else you can imagine. You name it, Alamo probably has it. Past markets have had some of the best jewelry selections to be found, with anything from handmade Czechoslovakian variety to second hand stuff that may be just what you are looking for. The Alamo Flea Market is the treasure hunter’s dream. Hosted in the parking lot of Antiquified Antiques and Collectables at least once a year, the best way to find out Alamo’s schedule might be to get in touch with the owners there. When it comes to selection, the Minneapolis Farmers Market is the cream of the crop. While it actually comprises of several markets in one, the Lyndale location is by far the most popular. Open 7 days a week from May to October, the Lyndale Market features vendors selling fresh produce and artisans offering everything from clothes to handmade artisan jewelry, accessories, garden art, and freshly cut flowers. On weekend mornings, the energy at the Lyndale Market rivals that of a State Fair, complete with families enjoying hot, juicy brats and sweet corn as they roam the iconic red-roofed sheds that house the vendors—but be wary that parking on weekend can be an adventure in itself. The location also houses a Winter Market, selling Christmas trees and other seasonal goods with a schedule that can be found on the Minneapolis Farmers Market website. The website also features a list of vendors with descriptions and contact information if you are curious to know where the fresh vegetables, produce, and crafts come from. Mercado Central Flea Market is a Mexican-style market selling food, crafts, and Spanish goods from books and music to spices and produce. The thriving marketplace consists of about 45 businesses at the corner of Lake Street and Bloomington Avenue in Minneapolis. TripAdvisor reviewers call the place a ‘cultural wonderland’ with shops, grocers, and restaurants to satisfy your craving for something a little different from the market norm. Mercado Central is thriving with colorful foods, spices, languages, music, and crafts. The people are kind, always happy to strike up conversation and help you find exactly what you are looking for. Whether you are just looking for an authentic taco lunch, or seeking handcrafted Mexican gifts, walking into Mercado Central is taking a step into Latino Culture. Open daily from 8am-8pm, Mercado Central Flea Market is an experience like none other to be found in Minneapolis. Though the venue in a local parking lot is fairly small, the Kingfield Farmers Market has a knack for packing in all you could ask for into an outdoor market. Whether you want some fresh fruit from one of the several orchards at the market, or feel like sampling artisan breads and craft-made pickles, whether you’re looking for fresh produce or hoping to learn a little something new, it is easy fall into conversation with the folks who grow the food. Your chat might result in a tip or two on how to add a personal touch to the produce you plan on cooking. The Kingfield Market also features the occasional jug band, local chefs offering al fresco cooking lessons, and a great place to see local artisans at work. Launched in 2001 with a pickup truck full of vegetables, the Market has since grown into a bustling market with thirty vendors every week and thousands of customers attending every Sunday. Though it is a produce-focused market, Kingfield also features some handmade crafts, music, and children’s activities. Playing a prominent role in the local food scene, the Kingfield Farmers Market even won City Pages’ Best Farmers Market award in 2013 and 2011. The market is open seasonally May-October, every Sunday, 8:30am-1pm. Located just 20 minutes west of Minneapolis in the Medina Entertainment Center Parking lot, the Hamel’s Lion Flea Market offers a selection of antiques, collectables, bargains, crafts produce, plants, as well as a fall Farmers Market. The Hamel’s Lion Market offers spaces for hundreds of dealers coming from all over to sell their treasures, catering to the mass of people coming from all over to buy said treasures. 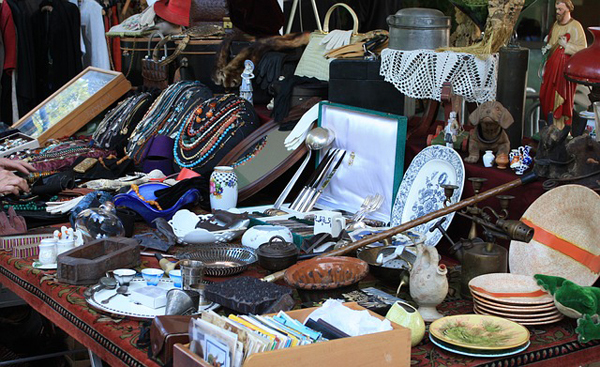 Whether you are looking to buy or sell, Hamel’s Lion Flea Market is a sight to be seen. Taking on the feel of a bustling bazaar, one could spend an entire morning rummaging through the acres of goodies to be found. Just about anything imaginable from old tools and antique furniture to vintage Nintendo games and sports paraphernalia has been known to exist at this market. The market is open every Sunday from May to September 6am to noon. Be sure to get there early to have first dibs on the exciting doo-dads and thing-a-ma-jigs, antiques, and collectables just waiting to be snatched. While there are not a whole lot of flea markets run in the wintertime, The Anoka Fling Flea Market seeks to fill that void. Held once a month from November to April inside Anoka’s Knights of Columbus hall, the market features up to 30 vendors selling anything from purses and vintage glass beads, to homemade jams and jellies, military artifacts, unused makeup and comics—your usual flea market fare of treasures! Local antiquers also take advantage of the market as the cost of renting a space is much more affordable than the upkeep of a store. You’ll never know what kind of collectibles have been gathering dust in a vendor’s cellar or attic — one man’s trash just may very well be another man’s treasure. While a dusty old table may be a space hog in one vendor’s home, a buyer might see potential to refurbish and make something completely new. The Anoka Fling Flea Market is a hot spot for finding hidden gems. For this year’s schedule or info on how to rent a space of your own, visit the Anoka Flea Market’s website.